I was walking on a low concrete wall, maybe three feet tall and two feet wide, next to a sidewalk along a street. Across the street were buildings, perhaps trees, but all without much color, mostly shades of gray as if it were near nightfall on an overcast day. On my right side the wall dropped off ten feet or more down to a paved area with no vegetation, perhaps a parking lot. I was walking closer and closer to that side of the wall, the side with the steep drop-off, and I began to worry that I would fall off but I couldn't seem to keep from drawing steadily closer to the edge, until I actually did fall off. I fell feet first, almost slowly, and landed on my feet then dropped to my hands and knees, as I would after a ten-foot fall. I thought I might be hurt so I stood up carefully and took a few steps, and found that I was OK.
On the left side of the street and a little above it a pick-up truck was parked. It had been there a long time, parked under a persimmon tree whose branches, heavily laden with ripe persimmons, were draped over the cab and hood of the truck. The persimmons were fully ripe, deep orange, soft and yielding with taut smooth skin, but when I looked closely I found that most of them were somewhat flattened and cracked open, like a ripe tomato in your pocket after you accidentally sit on it. Some of the persimmons had vegetarian meals inside of them, like Susan used to fix when we were more conservative in our Adventist practices. The glistening orange flesh looked fresh and inviting but when I tasted one, it had a disappointingly sour taste along with some of the usual sweetness. I tasted several more and they were all the same, not so bad as to be inedible but not really good enough to eat. Not all of them were cracked but the undamaged ones were misshapen, flattened and elongated, and they too had the same semi-sour unappetizing flavor. Another man was there and he was picking some of the persimmons but I didn't want them and didn't pick any to keep. 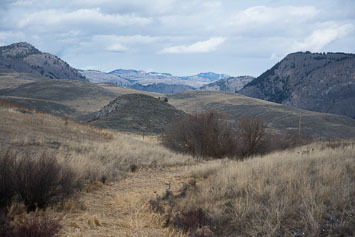 Today I completed the study of the Scotch Creek Wildlife Area that I started on my trip with David last month. 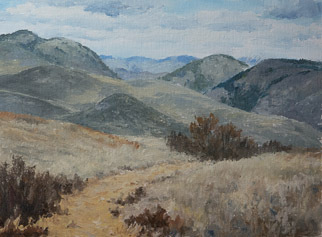 It's a painting of the little valley near Conconully where we saw the Gray Partridge and American Tree Sparrows. I slept well but woke up at first light as I usually do, though this morning I was able to go back to sleep. I woke up again recalling two dreams clearly. In the first dream I am doing a long loop run around the North Cascades highway and despite having come over 100 miles from home in Auburn, I am feeling great and running almost effortlessly, like I used to back before ALS. I run up onto a bridge high above the river and abruptly stop and sit down on the pavement. It is good that I did because had I run a couple steps farther, I would have run off the end of the uncompleted bridge and fallen 150 feet of more down into the muddy river. The small section of the bridge that I am on has detached from the rest of the bridge and has become a black metal platform a little bigger than a card table standing on its own high above the river on tall skinny poles. I am sitting cross-legged and immobile in the center of the table. It feels precarious and my feeling is justified. The platform begins to tilt and sway and though I remain stationary I am very anxious that it will tip over. About twenty feet below me, from a lower level of the bridge, a cable runs across to the other side of the river. A roughly-made open steel cable car, like an oversized sardine can, is docked at this side of the bridge and a few people are climbing into it to be transported across the river. None of them notice me; I am isolated and alone. In the second dream I am alone in the driveway along the side lawn of the house in Jackson. It is May 1st but it has been a big snow year and fresh-looking snow lies two feet deep on the lawn, and perhaps a foot deep over the field. The driveway is being plowed. After doing the driveway the plow turns out into the field and plows a straight path over Mom's flower garden in front of the low boulder, and into a blue pickup truck parked by John's vegetable garden. I worry that Mom's flower garden was damaged, then I am walking alone down the road in front of the house in summer. I am very sad and I am sobbing. My crying wakes me up but I don't know why I was so sad. This week I've felt as though my default mood was sadness. All this past week the weakness in my arms and shoulders, and the effort required to do simple tasks like eating and showering, have been reminding me that I will soon be unable to do these things by myself. Though I believe something will work out, I don't know how I will manage or whether I will be able to ask anyone to help me. Yesterday evening I was thinking about the amount of snow they had in Jackson this past winter and recalling the big snow year of 68-69. I missed being in Jackson that winter too because I was at Exeter. The plow running over Mom's garden and stopping at the blue pickup truck represents the death of Mom and Dad respectively, and perhaps John as well. Dad had an old blue Model A pickup when I was young, and John has a pickup now. The house in Jackson where I grew up still represents home even though it hasn't been my home for decades. Walking past it I am leaving my life behind, losing all I have, all that I am, and any opportunity for the future, and as with the disability, I feel as though I am facing death alone. I walked over to Dreamclinic for a massage today. The idea was to perhaps release my body memories of the stresses I've accumulated over the past few years. Though the massage felt soothing and relaxing, I developed a somewhat stiff neck and slight headache afterwards, as if the massage extracted the stress from the rest of my body and focused it in my neck. Perhaps that was an effect of the craniosacral component of the massage, though the general tone of a Wikipedia article on craniosacral therapy is skeptical. I'm inclined to believe Wikipedia. Tim and I ran around Green Lake this evening, three miles at an average pace of about 10:00/mile including a few walk breaks. Our running pace was closer to 9:30/mile and again I felt pretty good. All last month I felt tired and clumsy whenever I ran, as if my legs were unusually heavy, but for the past few days, including much of the Tacoma City Marathon on Sunday, running has felt good again. Afterwards we ate at the Elysian brewery/bistro in Tangletown, a cute little neighborhood of diagonal streets centered around a cozy commercial district on N 56th St between Green Lake and Wallingford. My Caesar salad was underdressed but the eggplant stuffed with couscous was clean and flavorful. I wasn't familiar with Elysian beers; my impression after working through a sampler was that they tend to be intellectual brews with a mix of flavors requiring some thought to appreciate. A slightly unpleasant hint of charred hops seemed to be common to several of them. The Dragonstooth Stout and the Mortis, a slightly sour pale ale brewed with persimmons, were the best in our opionion. The amber brewed with Hatch chiles was also quite interesting, earthy with a hint of chile heat, and although I don't like reds the Mens Room was one of the better examples of the genre that I've tasted to date. After our glasses and plates were mostly empty we talked about authority and God. We agreed that because humans evidently needed God, the objective reality of his existence mattered less than the characteristics we attributed to him. Imbuing him with the ability to create satisfied and perhaps gave meaning to our own creative impulses and attributing him with love enriched our own capacity to love. Tim suggested that my recent rejection of God might be another manifestation of the tension between rebelling against and submitting to authority that characterized my high school years. An interesting observation with some truth to it but I see it as the beginning of a resolution of that tension, a resolution accomplished by becoming my own authority and accepting in myself the qualities both good and bad that I've been projecting onto God and other external authorities. Perhaps then I can attain a view of God relatively unobscured by those parts of me both kind and critical that I've long assigned to him. Inspired by Wayne Sladek's bird list from his trip to the Great Lakes states last May, I decided a few weeks ago to go there myself. 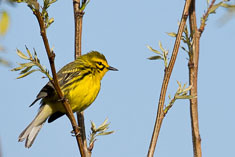 I wanted to see the northbound migration of the spring warblers and hoped to pick up a few life birds as well. My first bird book featured Blue-winged and Golden-winged Warblers on the same page and in my four decades of birding I still hadn't seen either one, or Cerulean either, and all three can be found this time of year in Michigan along with Kirtland's Warbler, a Michigan specialty. Wanting company on my expedition I talked friend and wildlife artist Ed Newbold into coming with me. Having grown up in Pennsylvania Ed is more familiar with some of the eastern birds than I am and I always enjoy birding with him. 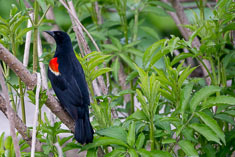 It was Ed who coined the term "Warbler Safari" for our trip. 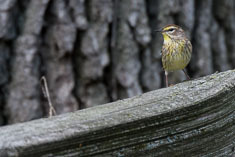 It was indeed a warbler safari; of the 37 warblers that can be expected during the spring migration through the Great Lakes states, we managed to find 35 and photograph more than 20. We drove about a thousand miles, spent about sixty hours in the field and had 165 birds for the trip. I gained five life birds to put my life list just three shy of six hundred. Ed wrote up an excellent account of our trip and posted some of his photos as well. Here's a link to Ed's trip report. Here's a list of the spots we visited. Since I was missing a local race in order to do the birding trip I signed up for the Tryon Farms 50K in northwestern Indiana. The race was on Saturday, the first morning of our trip, and I figured I could send Ed off to Warren Dunes State Park for eight hours while I was running. As we were walking out of the airport terminal in Chicago I realized that I could run another race anytime but had only seven days to chase warblers, so instead of heading northeast to Michigan City, we drove northwest from the airport, thinking that we would visit the Montrose Point Bird Sanctuary and its famous "Magic Hedge" first thing in the morning. When we started looking for a motel, the first several that we checked were full. We ended up at the Best Western in Morton Grove some 30 miles out of our way. 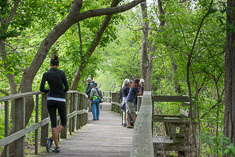 In the morning we set out for Montrose Point but on a whim, I suggested we stop at Linne Woods, a little natural area we drove by along the North Fork of the Chicago River. It turned out to be an excellent decision. 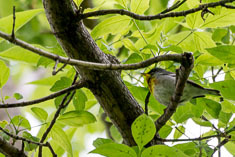 There had been a fallout of sorts overnight and we encountered more species of warblers at Linne Woods than we did at any other single stop on our entire trip. When we visited Montrose Point that afternoon we learned from other birders that the Magic Hedge had not been nearly as productive that day as Linne Woods had been. Though I only heard one warbler, a Chestnut-sided, as we drove into the parking lot, once we got out of the car the woods came alive. 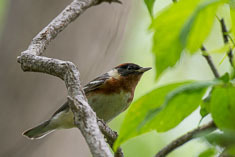 Within the first fifteen minutes we'd seen American Redstart, Tennessee, Nashville, Mourning, Chestnut-sided, Wilson's and my first life bird, a Golden-winged Warbler. Unfortunately I screwed up the photos of the Golden-winged by focusing on the background instead of on the bird, and I screwed up additional shots that morning by accidentally switching off the vibration reduction switch on the lens barrel. That wasn't the only time I did that while using the 80-400 but overall it worked well for me and I ended up taking some 1600 shots with it. 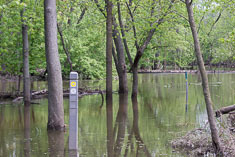 The river had flooded from recent rains and was still high enough that much of the bottomland forest was inundated and some of the trails were under water. The birds didn't seem to mind. 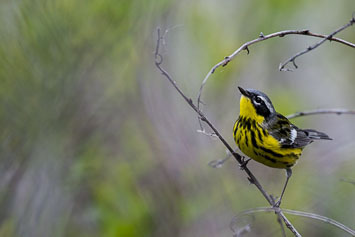 Bay-breasted Warblers and Northern Waterthrushes foraged on the logjams while mixed flocks of Canada and Wilson's Warblers and American Redstarts filtered northwards through the understory. 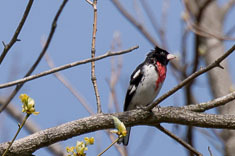 Northern Parulas and Black-throated Green Warblers sang in the treetops along with Indigo Buntings and Rose-breasted Grosbeaks. 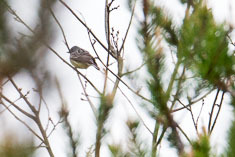 Mourning and Nashville Warblers skulked with Catbirds in the thickets. 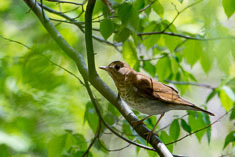 A Wood Thrush sang in the distance - a song I haven't heard in almost forty years. 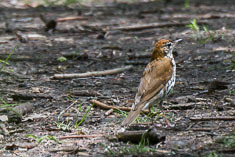 We saw Veeries and Swainson's Thrushes in the forest but couldn't spot the Wood Thrush. 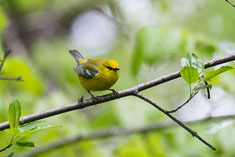 Around the edge of a brushy clearing we found my second life bird of the trip, the Blue-winged Warbler. We birded for a while with a biologist named Robert who was recording his sightings with pencil and paper as he waded through the flooded forest. He had a pretty good ear and was helpful in identifying some of the songs. He also suggested a location where we might find Henslow's Sparrows and explained their particular habitat requirements - open fields burned two or three years ago with scattered weed stalks and enough, but not too much, thatch accumulated since the fire. 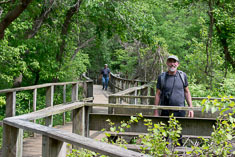 women then met a birder named Tom Vanderpoel, brother of John Vanderpoel who found 744 species in North America during his 2011 big year. With Tom we explored the beach and found a locally-rare Yellow-headed Blackbird and a mixed flock of Sanderlings and Semipalmated Sandpipers, along with one Dunlin, in plumages varying from basic to alternate and everything in between. 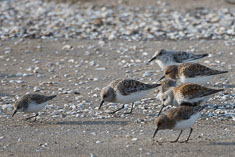 The alternate-plumaged Sanderlings threw us for a loop; we'd forgotten how brown and red they look. Back in the groomed part of the park we found a shade tree full of warblers, including Cape May, Tennessee, Blackburnian and Black-throated Green. 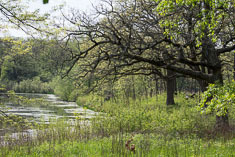 Though not as diverse as Linne Woods, Montrose Bird Sanctuary was better for photography; the trees were shorter and the birds seemed more tame. 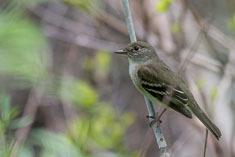 The Red-winged Blackbirds were especially tame but we were able to get close shots of a Least Flycatcher, a Gray-cheeked Thrush and several species of warblers. 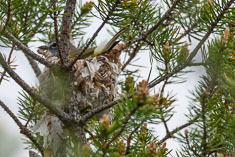 As we were getting into the car at 7:30PM, three Black-crowned Night Herons flew over. Once again we found the motels either too expensive or too full as we headed back west towards Barrington, the area where both Robert and Tom had suggested that we might find a Henslow's Sparrow. Tom had warned us that there were no motels in Barrington but on the smart phone I found a reasonably-priced America's Best Value Inn with plenty of rooms available right in town. With a place for the night secure, we took time to stop for dinner at Giacomo's Ristorante, a busy Italian place in Des Plaines with decent food but no good beer. front of the hill we found pairs of Solitary Sandpipers, Blue-winged Teal and Eastern Kingbirds. 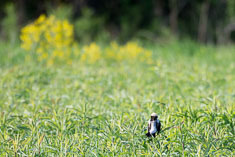 Bobolinks displayed in the lower areas of the field off to our right. No Henslow's Sparrows though. The field had apparently been burned just last year; there was very little thatch under the new green grass, not enough for the sparrows. 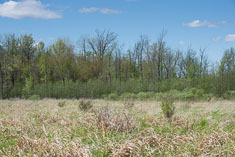 We hiked on towards the north where I could see an area of the field which had taller weedy growth. I figured it hadn't been burned as recently. We made it out there with dry feet after dodging several marshy spots. Ed was just about convinced that we weren't going to find any Henslow's Sparrows when I heard their distinctive "tsileek" song, not unlike the first phrase of a Dusky Flycatcher in Washington, somewhere up ahead of us. When we spotted the bird it was farther away than I expected, just a bright spot in a bit of a hedgerow near the far edge of the field. 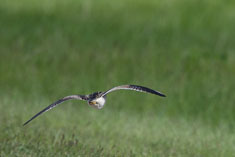 I snapped a few distant photos but the bird disappeared out into the field well before we got close. Life bird #3. We returned via deer and horse trails through the woods, which was mostly young and brushy second growth - oak, elm, maple, cottonwood, basswood and other species I didn't recognize. 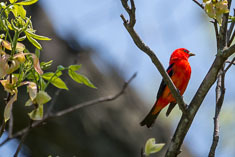 Bird highlights included our first Red-headed Woodpecker, a Great Crested Flycatcher, two flycatchers which turned out (as did most of the Empidonax Flycatchers we saw on our trip) to be Least Flycatchers, and a brilliant Blackburnian Warbler in the crown of an oak tree. 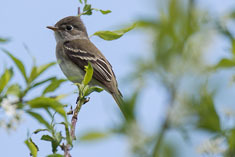 Least Flycatchers are distinguished from other Empids in the area by their very short primary projection. More easily discerned in photos than through binoculars, only four or five primaries extend beyond the secondaries in the folded wing. 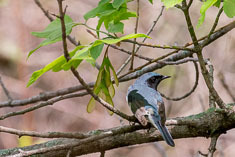 Color wasn't helpful in the field; sometimes the birds looked brown, other times green or gray, though they generally had a big-headed, long-tailed appearance. 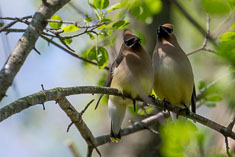 Searching for a singing Field Sparrow on the way back, we came across a small flock of Cedar Waxwings, two of which were sitting side by side and passing a shriveled fruit or berry back and forth with their beaks. It looked as though they were kissing but they were too quick about it for me to catch them in the act with my camera. We didn't spot the Field Sparrow until I played its song on my phone, then it showed up promptly. 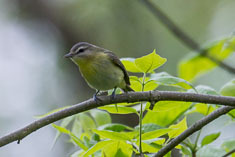 Just east of Penny Road Pond a Yellow-throated Vireo (which I initially misidentified as a Blue-headed, but the Yellow-throated song is more burry, more like a Cassin's) lured us into the woods again. 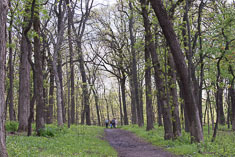 We followed another horse trail through an open grove of tall walnut(? 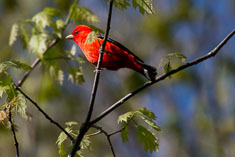 )trees adorned with Indigo Buntings and a brilliant male Scarlet Tanager, then continued across a brushy field into a grove of oaks. We heard and saw a Philadelphia Vireo in the oaks, only my second ever, and spotted a nighthawk roosting on an oak limb on our way back. Lots of Field Sparrows singing around the brushy field. red-haired woman named Pat who had photographed them, then we photographed a preening Magnolia Warbler and a stunning Scarlet Tanager. From the waterfowl blind we saw only Double-crested Cormorants, a Great Blue Heron and a Great Egret but along the path we came across small flocks of Yellow-rumped, Cape May and Palm Warblers. 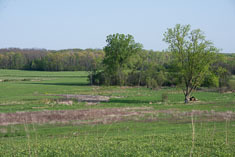 The fields, recently burned, had no Henslow's Sparrows. On the way back in we met a man named Brad and pointed out some of the birds to him. When we got back to the car he gave us a brochure about places to bird in Berrien County, where we were headed. Aiming to stay somewhere near Warren Dunes, we pulled into Michigan City around 8PM and despaired of finding a decent restaurant open until we discovered the Shoreline Brewery. It turned out to be the best meal of the entire trip, with a sampler of excellent beers to go along with it. Researching a motel on the phone I discovered that there were lots of them north of town on the way to Warren Dunes so we headed north. Just before the Michigan line we pulled into The Hidden Inn, a small motel with a handful of cabins tucked into a grove of tall oaks. For $75 we slept soundly in a dark and quiet cabin with nighthawks coursing overhead, delighting Ed. In the morning Ed was birding in the parking lot when I awoke. 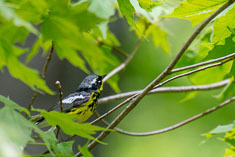 Tennessee Warblers were singing in the treetops all around. Excited about the possibility of another fallout we packed up quickly but it took a while to pry ourselves away from all the birds around the motel. One warbler song in particular stumped us until we realized it was just another Indigo Bunting. 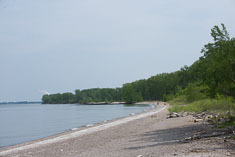 We followed signs to Warren Dunes State Park, paid our ten dollars at the self-service entrance station and drove the road into the park but couldn't find the trailheads described in the book. Instead the road led out to the beach. As we were driving along a bluff above the beach I heard a new song, not completely unfamiliar, so we stopped to check it out and found our first and only Prairie Warbler of the trip. That was one of the species I was looking for and I'd expected it to be more difficult to find. We parked along the road by a No Parking sign and after taking a few photos of the Prairie Warbler, set out to see what else we could find. We found sparrows - White-crowned, Song, Field, Swamp and Savannah - between the road and the beach, a flock of Turkey Vultures sunning their wings down on the beach, a few gulls offshore and a few other warblers in the trees overhead and up on the hillside. Our most exciting find though was in the thickets below the road. 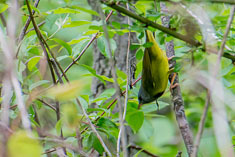 Along with a female Common Yellowthroat, I caught a brief glimpse of another warbler, clear bright yellow below and unmarked dark olive green above with a short strip of bright yellow or white above a black area immediately around the eye. 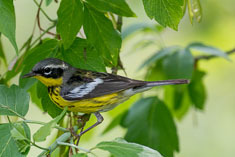 It could only be a Kentucky warbler, a rare overshoot migrant in Michigan. Ed didn't see it and scarcely believed me. 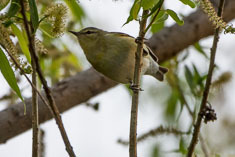 We spent a little more time searching for it then moved on to investigate an unfamiliar series of short buzzy notes coming from a cottonwood near the first parking lot, notes which turned out to be a Palm Warbler song. We picked up a few more species but began to get the feeling that the warbler fallout we'd anticipated was happening somewhere else, perhaps at Floral Lane which was where we'd intended to go in the first place. At Floral Lane we joined a little clump of birders conferring in the parking lot. 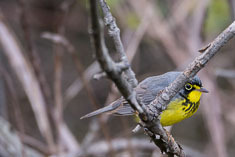 When we mentioned the Kentucky Warbler one of them asked a few quick questions then took off. 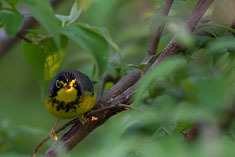 About an hour later he caught up to us on one of the trails and reported that he had successfully relocated our Kentucky Warbler and was grateful to us for the report because he'd seen every warbler species in Michigan for seven years running and as of this morning had yet to find a Kentucky Warbler, typically one of the most difficult to get, for this year. 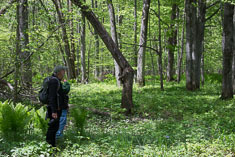 Now he was looking for a Worm-eating Warbler which had been reported a few days earlier on one of the trails in the park. We joined him in his quest and found him very helpful. Scott Jennex was his name and he really knew the songs. Though we did not find the Worm-eating Warbler, we did get more than a dozen others including our only Hooded Warblers of the trip. Most of them were high in the treetops so I had a hard time seeing them well due to the shakiness in my arms when I try to look up through binoculars. At least I can still lift the binoculars up to my eyes. By the end of the summer I doubt I'll even be able to do that. After Scott left we walked the Yellow Birch trail and picked up a dozen more species. 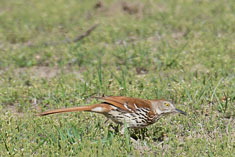 We also actually saw, and not just heard, a Wood Thrush. Ed spotted it first in the trail ahead of him. I'd been lagging behind and when I started running to catch up, I tripped over a root and did a hard faceplant. Fortunately the ground was soft and I was unhurt other than a bruise on my chest and a fat lower lip. 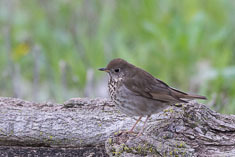 I saw the Wood Thrush and even got a photo. Though there were several other spots described in our Berrien County birding brochure that I wanted to visit, I decided we'd better head across the state to Magee Marsh in northwestern Ohio, a famous migrant trap on the south shore of Lake Erie. If it was as good as advertised we'd want to spend an extra day there and we only had two free days before we were due to meet Wayne's bird guide friend Ryan for a day of birding the northern lower peninsula. First though, we had a stop to make at Baguette de France, a sub shop in Berrien Springs. I ordered the foot-long Egg sub with tomatoes, lettuce, cucumber, Provolone cheese and hot peppers with garlic sauce. Since I could only get one sauce on the sandwich I ordered a side of the curry sauce. Ed ordered the vegetarian ham (or turkey?) sub, also with garlic sauce and a side of curry. Both sandwiches were amazing, and sufficiently filling that we passed up dinner in favor of an hour an a half of birding at Magee Marsh. And what an hour and a half it was! Magee Marsh just blew us away. 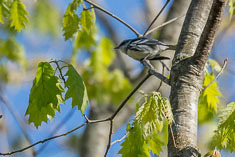 In ninety minutes we saw thirteen species of warblers and I was able to get close-up photos of seven of them. 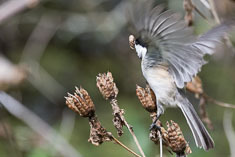 I have never experienced anything like it for bird photography. 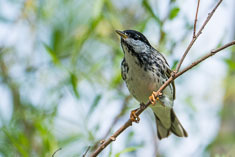 Many of the warblers were foraging within ten feet of the boardwalk and appeared almost indifferent to the birders strolling past them. 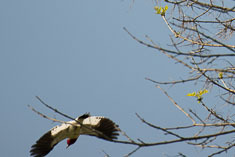 It being the spring migration, most of them are in full breeding plumage as well. 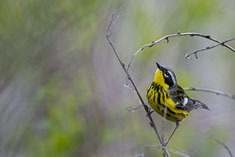 I felt as though I were in an aviary of North American warblers. 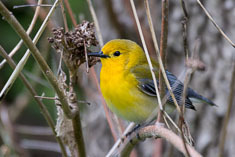 Yellow Warblers breed at the marsh and were by far the most common warbler species. I counted up to 30 along the quarter mile boardwalk and we heard them singing almost continually. 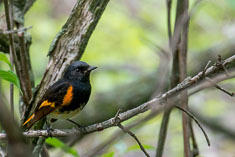 American Redstarts were the second most common warbler though most were not red, but yellow. I heard someone call them "Lemonstarts". Their songs are varied and difficult for me to consistently recognize. 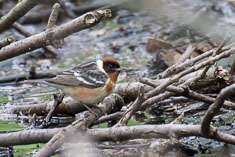 The males don't molt into the salmon-colored full adult plumage until their third summer. 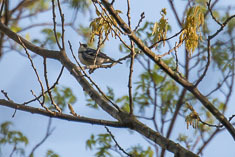 The Cape May and Tennessee Warblers were in the same willow tree by the tower at the west end of the boardwalk at sunset. 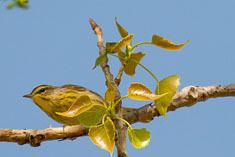 This was the only adult male Cape May warbler I've ever seen and I was sorry not to get a better photo of it. 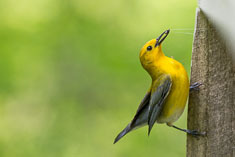 Both the Canada and Prothonotary warblers drew a crowd of photographers whenever and wherever they showed up. During the course of the day today we saw or heard 25 species of warblers, exceeding by 3 species my second highest total ever which was two days ago. We arrived at Magee Marsh at 9AM and left at 8PM with an hour off for lunch. 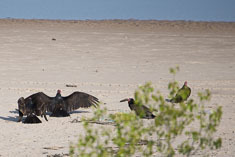 Bird diversity was somewhat reduced from yesterday but there were still plenty of birds to see. 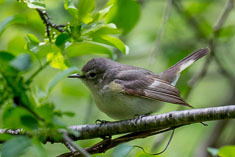 We had something over 80 species altogether including 19 warblers. I shot about 400 photos. 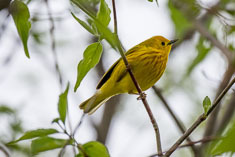 The highlight of my day should have been seeing a Connecticut Warbler, which is probably the most difficult warbler to find at Magee Marsh. I was hanging out at the corner of the boardwalk where it had been reported earlier in the day, though not specifically to look for the warbler. 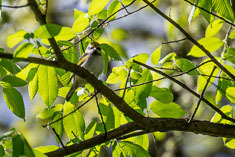 I was attempting to photograph several species including a Canada Warbler in an apple tree and a Northern Waterthrush in a tangle of branches down by the water when another birder nearby spotted the Connecticut. 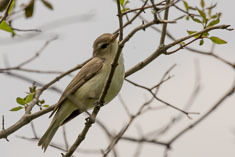 I followed it with my lens, got a clear view of the olive green body, pale gray hood and white eyering but didn't immediately recognize it as the Connecticut, nor was I able to get a photo. Each time I tried it either moved too quickly or I couldn't get focus in time. In effect I traded the opportunity for good views through binoculars for the chance to get a photo and got neither, which left me frustrated rather than grateful for the rare sighting. It was my 30th warbler for the trip. I called Ed who came over promptly but the Connecticut Warbler did not reappear. For a break after lunch we walked the Crane Creek Estuary Trail. It was the slow time of day and we didn't see much. 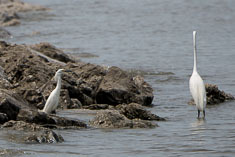 Ed found the two egrets at the mouth of the creek while I was talking on the phone. 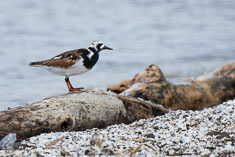 On the way back we met a single woman in her 50's who told us about the Ruddy Turnstones on the beach. There were 20 of them altogether and they seemed larger on the lake beach than they do along ocean beaches back in Washington state. 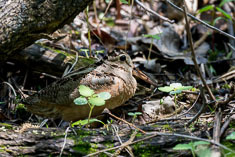 The woodcock is also a shorebird, albeit an unusual one which lives in damp woods. 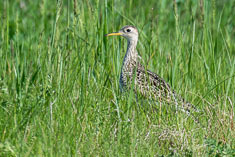 Right by the parking lot in a fenced-off area of tall grass one was sitting on a nest. This bird, probably its mate, was foraging along the boardwalk by probing its long bill almost up to the hilt in the soft ground and holding it there for a moment, apparently feeling around for worms. When it moved it walked deliberately with a strange undulating motion, as if it were practicing to be a belly dancer. 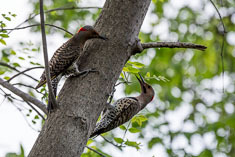 These two male flickers engaged in a territorial dispute were about the only ones we saw at Magee Marsh. 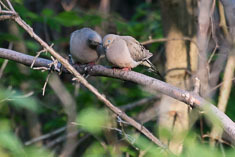 The pair of Mourning Doves were demonstrating the origin of the term "lovey-dovey", grooming each other at sunset. 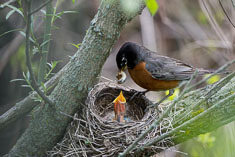 The American Robin fed a big grub to its one remainimg chick while I was hanging out at "Connecticut Corner". According to another birder, there were two chicks in the nest yesterday but today there only seemed to be one. 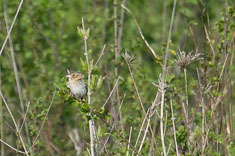 We saw and heard four Empidonax flycatchers at the marsh - Yellow-bellied, Alder, Willow and Least. Alder and Willow are almost identical; I'm calling this one an Alder based on the thin eyering, which Willow lacks. 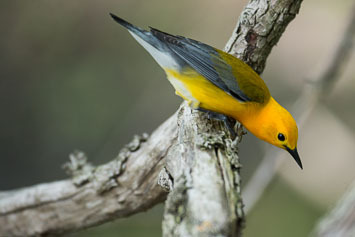 Yellow-bellied is somewhat more yellowish, especially below. Both Alder/Willow and Yellow-bellied have longer primary projection, 5-7 primaries extending beyond the secondaries, than Least (~4 primaries). 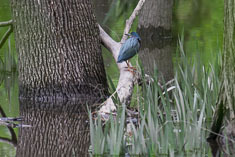 Some of the warbler species were scattered all through the marsh but many of them seemed to hang out in particular spots. Up to a half-dozen Bay-breasted Warblers, both male and female, were in the patch of woods by the small bridge when we arrived yesterday evening and were there again today. 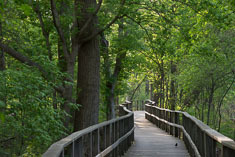 We didn't see them in any of the other wooded areas along the boardwalk. 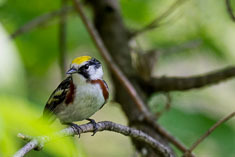 The Chestnut-sided Warblers were scattered around but were only present today. 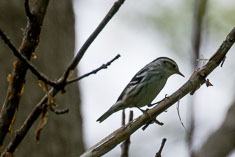 A few Blackpoll warblers were also distributed around the marsh, singing as if on territory despite having a long way to go to their north-woods breeding grounds. 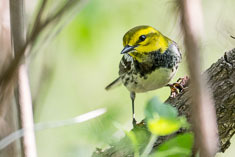 Magnolia Warblers were one of the more common species, Black-throated Green and Northern Parula among the less common, represented by one or two individuals which we did not see'yesterday when we arrived. If warblers had human roles the Prothonotary Warblers would be runway models, both the most beautiful and the easiest to photograph of all the warblers at the marsh. 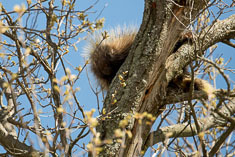 They consistently foraged at eye-level or lower within a few feet of the boardwalk, and even on the railing of the boardwalk itself. They moved slowly and deliberately with long pauses for photo ops and they announced their arrival with a loud clear song. 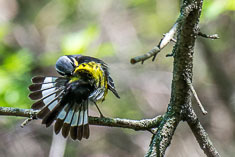 After too many Prothonotary photos I determined not to take any more, and it was at that point, when my camera was in its case, that two of them chose to mate right in front of me. A brief encounter, it was over by the time I got my camera in position. 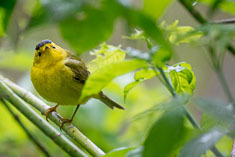 Wilson's Warblers and Common Yellowthroats are common in Washington State as well as at Magee, the latter so familiar that I never even got a photo of them. Canada Warblers were surprisingly common considering that before this trip I'd only ever seen them twice even though they nest in New Hampshire where I've done quite a bit of warbler-chasing. This one caught the setting sun beautifully. Since we were spending a second night at the Our Guest Inn and Suites, a birder-friendly motel in Port Clinton, we took time to eat out at Slater's, a local bar in town. Neither food nor beer were anything special but the waitress/bar girl was cute and friendly. She actually asked us about birds. We told her about the amazing birding at Magee Marsh and she said she might take her nephews over there on her day off. Feeling a little fried today from all the intense birdwatching the past few days, or perhaps just from drinking too much beer last night at Slater's. I left my coat there and had to sacrifice my last hour at Magee Marsh to drive back and get it. The morning began with a bit of rain which had stopped by the time we arrived at the marsh. The air was still and a bit muggy, conditions favorable for mosquitos but fortunately they were scarce. Knowing what to look for and where, I got our highest species (62) and warbler (17) counts on this mornings count, our last visit to the marsh. We also finally found a Black-throated Blue Warbler, warbler species #31 filling the most glaring gap remaining in our warbler list. 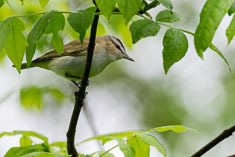 Where else but Magee can you compare the three similar North American Vireos - Red-eyed, Philadelphia and Warbling? 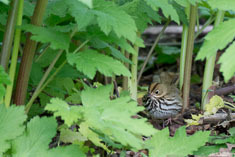 Red-eyed has the most distinct eye-stripes and flattest head, Warbling the softest eye-stripes and rounded head, and Philadelphia is in between. 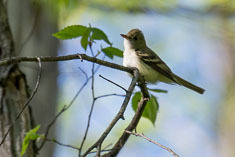 The Philadelphia Vireo photo is actually from yesterday, the other two were taken today. I photographed three warblers today which I'd missed the past two days, but wasn't able to get good photos of them today either. 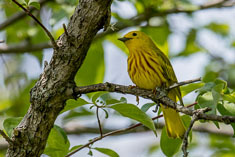 I always seemed to show up a minute, or even sometimes just a few seconds, after a Mourning Warbler disappeared back into the thickets from which it had emerged. Ed finally saw one of them yesterday and I had a brief but good look at one yesterday as well. Unfortunately during my one Mourning Warbler photo op today the camera focused on the background instead of the warbler - the usual problem. With the Black and White, I missed a good opportunity yesterday and had to make do with a less good opportunity today. 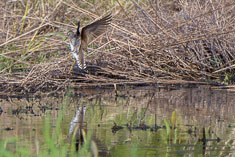 And Northern Waterthrushes just don't generally provide any good opportunities at all. Parting shots - Canada because it's so easy to see here, so hard to see elsewhere. 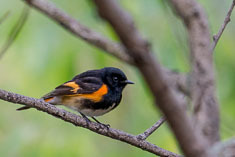 American Redstart because it's common and flashy, and Yellow because every other warbler at Magee Marsh is a Yellow Warbler. I'm sad to leave this amazing place but who knows, maybe I'll be able to come back next year. 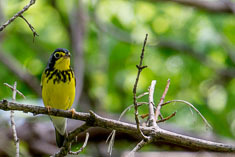 On our way back to Michigan we stopped at Pearson Metropark just east of Toledo in hopes of finding a Yellow-throated Warbler which had been reported in the tall trees around the Window on Wildlife building. 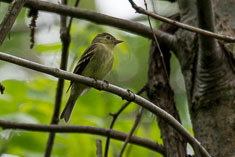 We didn't find the warbler, or any others either, but collected a modest bird list and a half-dozen mosquito bites during an hour-long walk through that stately remnant of the infamous Black Swamp Forest of northwestern Ohio. Last year Wayne and Margie spent a day birding with Ryan Dziedzic, a birder in central Michigan whom they contacted through BirdingPal. Through Wayne I got in touch with Ryan and arranged for us to spend today exploring the central Michigan area with him, with an emphasis on finding a few particular species including Kirtland's and Cerulean Warblers, Sedge Wren, Orchard Oriole and perhaps Upland Sandpiper. Ryan met us at our motel, the Best Western on the east side of Mount Pleasant, at 6AM and we set out on a long and successful day of birding. We drove about a half hour north then made two quick stops at cedar bogs 4-6 miles northwest of Clare. Between Mount Pleasant and Clare Ryan pointed out the terminal moraine from the last glacier, and we noted how the weather changed from sunny and cool south of the ridge to cloudy and cold farther north. 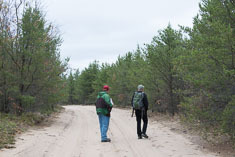 From the second cedar bog, we continued west on Muskegon Road across the river then drove various gravel roads through Jack Pine plantations on the west side of the river 3-4 mi south of Cranberry Lake. 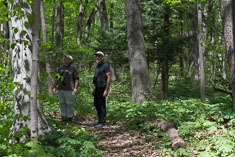 The pines in that area are starting to get a little old for Kirtland's Warblers; when we heard Ovenbirds singing Ryan said that was a bad sign. Once the pines get old enough that the bottom branches die off for lack of light, the trees are too mature for Kirtland's Warblers. 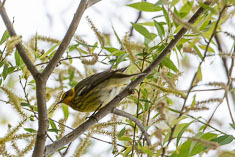 For the first hour we found no warblers, then we came across three or four around the south end of McKinley Road west of the river. 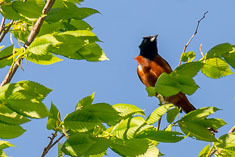 I missed our best photo op but got a few distant shots of one singing in a young oak tree. 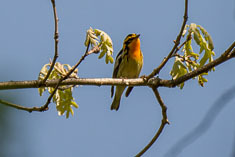 Having found the Kirtland's Warbler, we drove back south and east to Laur Big Salt River County Park, a sunny and buggy patch of bottomland forest about 10 miles northeast of Mount Pleasant. 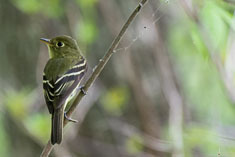 Our target birds there were Golden-winged Warbler, which we heard but didn't see, and Acadian Flycatcher which we neither heard nor saw. 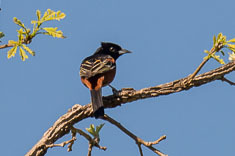 We continued driving around some of the roads a mile or two farther east and (somewhat to Ryan's surprise) succeeded in finding an Orchard Oriole in a flowering apple tree along Pere Marquette road as well as a handful of other species to pad our Michigan state and day lists. Continuing south on North Geneva Road we parked somewhere after the pavement ended and walked in a mile or so to a patch of pines on a low rise between two marshy and brushy meadows. 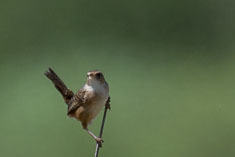 The northern one was more open and it was there that we found singing Sedge Wrens. Ryan explained that the whole area had once been White Pine forest but after logging, the area burned with such a hot fire that the sandy soil was left. 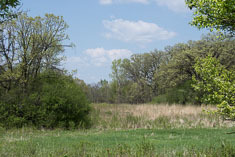 Now, a hundred years later, the forest is only starting to come back to oaks and cottonwoods with a low shrubby understory. Scarlet Tanagers, Rose-breasted Grosbeaks and Great Crested Flycatchers like it; we ended up with a pretty good list for it being the middle of a warm sunny afternoon. 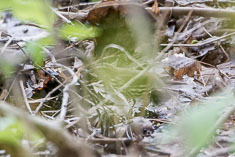 We also ended up with very stinky sneakers after wading out into the marsh to get a better view of the wrens. Our final stop was the Pine Haven Recreation Area, a patch of bottomland and upland woods sandwiched between US Hwy 10 and the Titabawassee River about 10 miles northwest of Midland. 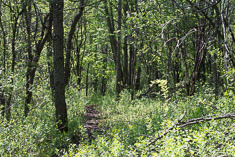 Wide hiking trails which double as cross-country ski trails in the winter meander through the area. Ryan assured us that Cerulean Warblers bred there but bird activity was pretty subdued when we arrived. 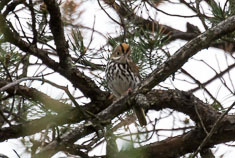 We did get a Louisiana Waterthrush to sing along a small stream and we found a singing Acadian Flycatcher, our first of the trip, at the far end of the park. Shortly thereafter we heard an unmistakeable Cerulean Warbler song. It was high above us in the crown of an oak tree. 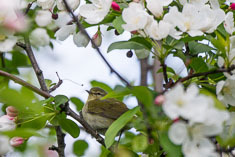 I played a recording and the bird became quite agitated, fluttering its wings and hopping around the branches searching for the source of the song, so I didn't play any more recordings. I did get a few distant photos. We wrapped up our birding at 8:00PM, a long day. Ryan knew a good Mexican restaurant in Sanford - Elvira's - but it was closed so we ate at the Red Oak instead. Ed had a pizza because there wasn't much else vegetarian. I had a rib eye steak, baked potato and salad bar for about $12. It tasted fine but I couldn't finish it. I ended up taking it home to Seattle where I threw it away because it had been unrefrigerated for too long. 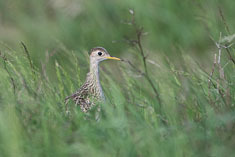 Ryan had suggested we try the nearby airport for Upland Sandpiper so after we packed up we drove over there. The weather was sunny, cold and windy, not ideal for birding but we found a few sparrows along the airstrip and a few warblers in the trees across the street. The Upland Sandpipers had been reported on eBird not at the airstrip but down the street at the country club golf course so we drove down there and sure enough, there they were, a pair of Upland Sandpipers poking around in the strip of lawn along the entrance road. A passing UPS truck spoiled my first photo attempt by flushing the birds but they gave us a second chance. Despite the photos, this sighting was considerably more prosaic than the last (and only other) time I saw them, out on the lonely prairie of eastern Montana where their haunting display song was a perfect soundtrack for the windswept landscape. Our last birding stop, after a quick detour into Berrien Springs for more footlongs from Baguette de France, was at Kesling Natural Area on the Indiana border to look for a Yellow-throated Warbler. They're reported to breed in the sycamores along the river there. We found sycamores and box elders and more dead ash trees. 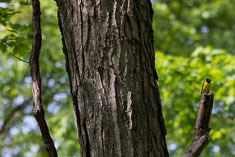 Ryan explained that all the ash trees are dying throughout the Midwest from the Emerald Ash Borer, an insect imported into Michigan from the Far East. The birds were having their midday siesta but I did get good close-up looks at both male and female Northern Parulas as they foraged down at eye level for a change. Unfortunately I'd left my camera in the car. Due to the weakness in my arms and shoulders sometimes it's just too much work to get the camera out. 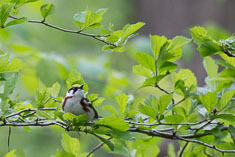 We never did see the Yellow-throated Warbler but we heard its unmistakeable song several times high in the canopy. 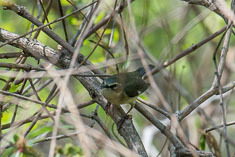 It was the only warbler species of the trip that we heard but did not see. The drive to the airport on Friday afternoon of Memorial Day weekend was difficult, not so much because of traffic (which was mostly headed the other direction) but because I was exhausted and the route was confusing, even with my phone's directions. But we made it without mishap, and so wrapped up a bird trip I'll never forget. This marathon was tough. I expected it would be, not because the course is particularly difficult but because I hadn't run in ten days and because I'd spent the previous seven days birdwatching ten hours a day. Birdwatching doesn't sound like a strenuous activity but ten hours standing or walking slowly is not a good idea even for the day before a marathon, let alone a whole week. But having skipped the race last week, I needed this one if I'm going to make 200 official marathons and ultras for Light at the End of the Tunnel. The first lap I felt heavy and slow, probably because I didn't eat breakfast until half an hour before I started running. I walked quite a bit, talked on the phone with Mom and John. Towards the end of the first loop I ate a gel and that helped. I felt fairly good the second lap, ran comfortably and felt almost normal. Once again I was on the phone when I passed the aid station, this time with David. The back of my left heel (my Haglund's deformity) began to hurt towards the end of the loop when I resumed running after my conversation with David, and it hurt for the first mile or more of the third loop before settling down again. By the end of that lap I was really dragging. It felt as though weights on my shoulders were pressing me into the ground. I ran at least half the time and somehow made it through to the finish, where after a few minutes, I felt pretty good again. Due to my time on the phone in the first half, I ran a 32 minute negative split and finished in 7:25 and change. 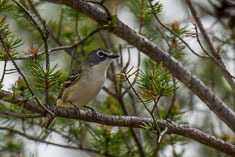 I counted birds the first half of the second lap and second half of the third lap and accumulated a good list, 30 species including Warbling, Hutton's and Red-eyed Vireos and Orange-crowned, Wilson's, Townsend's and Black-throated Gray Warblers. About all I saw were robins and juncos; everything else was by ear. 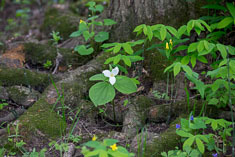 The forest there is very green and beautiful, tall maples and alders and even taller Douglas firs. The hardwoods in the midwest impressed me by how tall they were, especially in the bottomland forests. 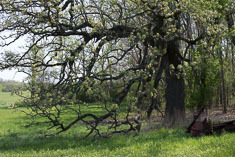 These trees are even taller though the impression of height is muted somewhat by the large size of the maple leaves. I switched the left and right buttons on my mouse today. For the past few days as I've been using the mouse with my index finger on the left button, my second finger keeps accidentally clicking the right button. The muscles that hold my second and third fingers up are weaker than those that pull them down so after a few minutes, those top muscles fatigue and my fingers start to curl downward, interfering with both my mouse use and my touch typing. So far only the right hand is affected so I can still type normally with my left hand. I tried holding my second and third fingers up by running pieces of tape from them over my knuckles to the back of my hand but then I didn't have the strength to bend them to type, so I switched the mouse buttons. By holding the mouse at a bit of an angle my index finger rests on the right button and my second finger drags harmlessly on the mouse pad. When my right hand gets too tired for touch typing I hunt and peck with it instead; usually after a short rest I can resume the touch typing again for a while longer. I've been remiss about writing down dreams. I see dreams as windows into the unconscious and therefore helpful in understanding what I'm feeling and thinking as I go through the remainder of this journey. These are some of the dreams I've recalled, and not wanted to forget, over the past few weeks. Last night: The owner of the house I was renting came over with his wife to spend the night and I helped them get settled into their bed in the rather cramped but well-lit basement. When I went back upstairs I realized I'd left the basement lights on and that it would be difficult for the owner to get out of bed and turn them off so I went back downstairs into the basement to do it for them. Each time I turned off a light there seemed to be another one that I had missed, light switches everywhere on top of steel posts like fenceposts throughout the cluttered basement and I would never be able to get them all turned off. Meaning: Stairs into a basement is a recurring image in my dreams, representing my death. In this dream I can't complete all the tasks I need to get done before I die, tasks that I am performing for the benefit of those I'm leaving behind. Last night: I was walking down a side street and the people on the sidewalk were speaking in an odd language. I realized they were speaking French backwards, as if on a tape played in reverse, so I called out "Just as I thought. French spoken backwards sounds like German." I continued alone down the street and passed two large tall young men, both burly and well over six feet tall though the one on the left was several inches taller than his companion. As I passed I was concerned that they would bother me and they did. They began walking with me, then walking in circles around me. When I told them that my shoulders were thin and weak they mocked me, pulling down their T-shirts to show me their muscular shoulders and saying "Our shoulders are weak too. Here, touch them, feel how weak they are." Up ahead was a house all lit up inside and I thought that if I went into the house I could get away from my tormenters. Inside the house, all I noticed was a narrow, well-lit stairway going down into the basement. I was worried that the men might have followed me into the house but didn't know if they had or not. Meaning: Another dream about my death and how I experience it alone - there is no-one who can go through this process of disability and dying with me. The two men remind me of the dead men in the tent in my dream back in March, and probably represent me despising the invalid I am going to be for several years before I die. The warmly-lit but empty house is my death, which apears in the dream as an inviting if lonely refuge from life. Both men represent acquaintances in college whom I found friendly but somewhat intimidating at the time. The shorter man was loud, brash and outgoing; the taller one more quiet, gentle and kind. Reflecting on well-lit house later, I felt very sad at the thought that death should appear as a refuge for me, and didn't understand why that would be. Two nights ago: I was working on a very large painting, perhaps eight feet square, and it was almost done. It needed just a little addition of a few mountains in the lower right corner, so I put them in and stepped back to see how they turned out. As I looked, I realized that the new mountains were crudely painted in white (black and white?) and spoiled the rest of the painting, and that moreover completing the painting was going to be far more time-consuming and difficult than I had anticipated, a project so far beyond my ability and commitment that I would never finish it. The stretchers were too thin as well and the painting buckled and warped as I looked at it. Meaning: This dream and the next, from two weeks earlier, share a common theme of a task which I expected to be simple and straightforward turning out to be far more complex and difficult than I thought. What that task might be remains unclear. Wrapping up my life, coping with disability, finding my way through the next few years - none of them really seem to fit. Nor is it clear what is meant by my addition of the mountains. The style of painting speaks of pain, mental anguish, "The Scream" by Edvard Munch, and the action, while well-intended, ruined what had been at least acceptable up to that point. The ambiguity of the task of completing the painting notwithstanding, the painting itself also represents me; the warping at the end a clear reference to my disability brought about by my muscles being too weak. Two weeks ago: I am on the flat roof of a tall building in a city. I have the sense that David and Susan are with me. Needing to get over to the roof of another building nearby, I spread my arms and get horizontal in the air to fly over there. My arms aren't wings though, so I land flat on my face right where I am. I try again and the same thing happens. It is then that I realize that getting to the next building will be far more complicated and difficult than I had imagined. I had thought that all I had to do was spread my arms and fly over there like a bird or an angel, but that thinking was far too simplistic and reality is much more complicated. In the end of the dream I left the roof, perhaps via a stairway, to try another approach but don't remember what happened after that. Meaning: A task or transition which I need to do turns out to be far more complicated than I originally thought. As with the dream of the painting, the nature of the task is not clear. In the years soon after college I was able to fly in my dreams, inspired perhaps by watching peregrines all day long, but over time I grew heavier and heavier in my dreams until I could barely get off the ground and in this dream, I can no longer fly at all. The transition seems to involve leaving Susan and David behind though that was not its objective. Two or three weeks ago: It is dusk and I am walking along a sidewalk with lawns and shade trees on my right, a college campus perhaps. I pass a red sports car with two men in it and am concerned that they will come after me. They do, and I run down some curving concrete steps along a brick wall and dash into a dormitory common room or cafeteria, unsure if my pursuers saw where I went. I go through a door into a series of rooms like a museum or gallery with shelves on the outside wall. Artifacts and beautiful things are arrayed on the shelves, all red and gold and bathed in warm golden light. I think I am safe from my pursuers then I realize that the wall behind the display shelves is glass and that the men might still be able to see me. I follow a middle-aged man through a door into an empty hallway from which a door on my right opens to a steep narrow stairway that descends as far as I can see into darkness. Meaning: The long stairway down into darkness clearly represents my death. The museum or gallery preceding it represents my life at present, rich with friends, relationships and experiences. My pursuer(s) - a Jungian analyst might say that they represent my Self, demanding expression in my life, but they might instead symbolize ALS, the disease that relentlessly stalks me and from which, ultimately, there is no refuge. More likely though they represent me, or some parts of me, which I am not willing to face. I realized today that the photo upload feature has been failing for a couple of weeks on both the Halffanatics and Maniacs websites. I haven't looked at that code in several years and it took me a couple hours to reacquaint myself with it. When I did I discovered that I had over-engineered it and that the call which was failing was actually unnecessary. It apparently began to fail when Godaddy tightened up their security on user impersonation. The Godaddy support person had suggested instead that the failure was due to my having an excessive number of files in the folder which stores the profile photos but I tested that theory and that wasn't the problem. I managed to get it working again by lunchtime but didn't get out for a run this morning as I had hoped. 5/30/2014 Strength in my Future? It has been two weeks today since I completed my 5-day intravenous ImmunoGlobulin treatment. If it is going to work I should see some increase in strength in the next couple of weeks. IvIG has no effect on ALS so if my strength does improve, then what I have would not be ALS but another even more rare disease in which the symptoms can mimic ALS, but which can be treated and is generally not fatal. The additional clinical tests I had back in April did not provide any evidence that what I have is not ALS. Instead, it looked as though I simply have one of the many variations of ALS, albeit one which typically proceeds somewhat more slowly than the usual 3-5 years. I might have 5 or more left but if so, would still be disabled for most of that time. That would still leave me no future except increasing disability and death. If on the other hand my strength begins to return, so would my future. With ALS there is no opportunity for hope but with strength, hope could regenerate as well. Yesterday I felt like my strength might be returning. My strength felt sufficient for the tasks at hand, though it could be just that I'm getting used to the weakness. There's so much riding on this that I'm afraid to hope, afraid to believe that there might be light ahead and not just gathering darkness. I wrapped up the profile photo upload changes this morning; as usual, the longest part was tweaking the html to fix all the little wording and formatting errors. Then I began working on going through email and processing long-overdue refund requests for the marathon. Susan and I met in North Bend to search, unsuccessfully, for additional parking for the race, then I met Marc for beer and snacks at Tap House Grill in Bellevue. I'd hoped to get out birding for a couple of days but have been bogged down in Tunnel stuff - emails, supplier orders, refunds, finding parking - and won't be able to. However, I did get all the emails either answered or deleted, the bibs and Gu ordered, parking lot request submitted and remaining permit applications mailed off. Left to do: buses, porta-potties, jug spigots and confirm parking arrangements. Also rescheduled today's acupuncture appointment before I realized I didn't actually need to do so. Oh well! Each session is less fun than the previous and the whole enterprise feels pointless since my arms have continued to weaken and the fasciculations in my legs have continued to increase during the month-long course of weekly treatments. In my opinion treating ALS with acupuncture is akin to flogging a dying horse. More flogging won't help. In my acupuncture doctor's opinion, we're not seeing results because we're not doing enough. More rest on my part, more needles and electricity on his part might just turn the tide. Not that he claims he can effect a cure, only slow the progression. But the ALS isn't listening. Lunch with John at Chutney's Bistro today. I talked about my dreams, the idea of death as a refuge from the pain of living with myself and my sadness about that but also my joy in birding last month. He talked about his joy in geology fieldwork in Utah last month, the fascinating and beautiful soft-sediment deformation structures in the Navajo sandstone of the Coyote Buttes area. We talked about God and the challenge of seeing God while partially blinded by the reflection of ourselves that we project onto Him, not to mention the possibility that He doesn't actually have any existence at all aside from that which we give Him. It was a good lunch; I admire John alot and am grateful that he values my friendship.